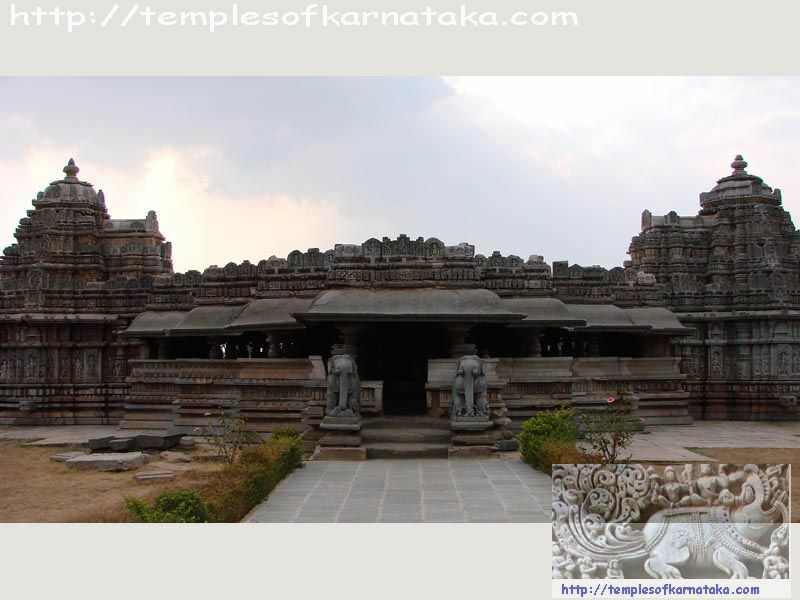 Belavadi Sri.Veeranarayana Temple is one the classical example where in unique temple plan is executed. The temple is a trikuta having Sri.Veeranarayana in the center facing East, Sri.Venugopala facing North and Sri.Yoganarasimha facing South. The temple is belived to be constructed in two phases, earlier the central shrine was constructed and later on the additions were made, but truly this temple is a marvel and possess the most beautiful images of Sri.Venugopala as Certified by the Archaeological Survey of India. As one enters the temple from the main entrance, one can see a huge entrance with slanting roofs covering it, this reminds me of the Tulunadu style roofing (one can observe such kind of roofings in Udupi Sri.Anatheshwara Temple just opposite to Sri.Krishna Mutt). Upon proceeding further, you see two Vimanas beautifully decorated with various images and separated by more than 100 feet in distance. This is the only temple which I have come across which is a trikuta and all the three kutas are widely spread across. You find few steps to get into the temple, two Elephants at the Dwara, welcomes you majestically. As you go further, you find a huge Navaranga completely filled with beautifully carved pillars, onto to your right you will find Sri.Yoganarasimha, sitting in Yoga posture with a Yoga belt tied upon. One can see the Dashavathara in the Prabhavali, Lord is holding Shanku(Conch) and Chakra(Disc) in either hands and the other two hands are resting on his knees facing downwards. The image is so beautifully carved, one feels like spending more time, just by gazing at it. One can make fine observations and find out the Jari(Border) design carefully executed on the Yoga Patti(belt). You can also find Sridevi and Bhoodevi on either side of the Sri.Yoganarasimha in standing posture. Onto to your left, you'll find the Sri.Venugopala which is in standing position under the Honne tree, holding a flute in his hands. The facial expression of the Lord is so charming, that one can clearly make out, he is enjoying playing his flute with his left eye slightly closed. He is standing in a Tribhangi position, where in his right leg is in front of left leg, he is supporting himself using his thumb to bear the weight, his abdomen is slightly bent to balance himself. On the either side of the image, you can find Shravan Kumaras in folded hand position, three Gopikas who are completely engrossed listening the Venu Vaadana(flute recital), one Gopika has completely forgotten about herself and she is not bothered to cover herself while her Vyjayantika(Duppatta) has completely fallen down. The cow which is feeding its calf, does not even bother to take care of it and it is completely listening to Kolalu, the Gopalakas are merily dancing and enjoying the recital as well. One can also find Sri.Rukmini and Sri.Sathyabhama on either side of Sri.Venugopala in standing position. Upon walking further you find one more Navaranga Mantapa with approach from both the side(North and South). Each of the Navarangas are richly decorated with superb ceilings depicting various stories from Bhagavatha. The Nagamandala is quite unique design where one finds it impossible to find the end of the Naga(Serpent God). The total length of the temple is about 270 feet and upon reaching the central kuta, you will find the beautiful image of Sri.Veeranarayana who stands with four hands, holding the Pashankusha in his right hand, Gadha in his left hand. The other two hand are in position where in the last finger, ring finger and middle finger are half closed, the index finger is half closed, but held up above the rest, the thumb is also half folded, in the left hand you can find some weapon but is not very clear. The prabhavali is well decorated with Dashavathara as the theme and one can easily identify all the incarnations very easily. The makara in the prabhavali is also well decorated. One can also find Sridevi and Bhoodevi on the either side of Sri.Veeranarayana. If one lies down at the main entrance of the Garbhagriha and look straight towards the East direction, you will find that the entire lenght of 270 feet is flawlessly levelled to such an accuracy that you will keep wondering. One can also see the horizon about 3 kms away without any disturbance in the level, this kind of expertise in levelling needs to be appreciated. Also on Summer Solstice, one can see the direct Sunlight entering the Garbhagriha without any hinderances. Upon taking a pradakshina along the temple, you will find various images of Vishnu Avatara, Ganesha, Shiva, Parvathi, Ganesha, etc., this temple needs additional time to explore and make sure you have sufficient time to spent both inside the temple as well as outside. 1.Belavadi is about 10 kms from Halebeedu. It is enroute between Halebeedu and Javagal. 2.One can also reach Belavadi via Bangalore - Arsikere Road on NH 206 and then take diversion onto State Highway upto Javagal. 1.Alight at Arsikere Junction or Birur Junction if your are travelling in Fast Express Trains and then take road to Belavadi. 2.If you are travelling by Express or Passenger trains alight at Banavara and then head by road. 3.Once the Kadur-Chikmagalur Railway Line is completed, alighting at Chikmagalur station would be more nearest point. 1.The nearest Airport is at Devanahalli and then either head by road or rail. 2.A new domestic airport is being constructed at Shimoga/Hassan, which would act as nearest airports. Restaurant : It is advisable to carry the food from either Hassan or Chikmagalur. Or one can have food at Halebeedu as well. Hotel: There are no major hotels to stay in Belavadi, it will be a good idea to stay either in Hassan or in Chikmagalur. ATM: There is no ATM available, the nearest ATM will be at Halebeedu or Javagal. Transportation: There are few private buses which ply along with KSRTC buses, but is advisable to take your own transport as it will be faster. Fuel Station: At Halebeedu you can find the nearest fuel station apart from Javagal. Health Care: A Primary Health Care Center is present in Belavadi.